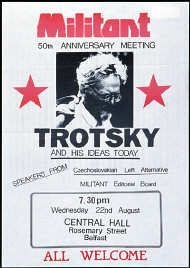 Recent days have seen the deputy leader of the Labour Party Tom Watson, as part of the campaign to get rid of Jeremy Corbyn attack the Socialist Party, labeling us as Trotskyists. But who was Trotsky, and what is Trotskyism? Leon Trotsky was a leader of the Russian Revolution, the first time that the working class successfully took power. When the Russian Revolution degenerated and a bureaucratic regime came in to being headed up by Joseph Stalin, it was Leon Trotsky who fought against Stalin to defend the original aims of the Russian Revolution – standing up for world revolution and for workers democracy. Trotsky, and innumerable supporters of the ideas of genuine socialism ultimately sacrificed their lives in the fight against Stalin. Indeed Trotsky was assassinated by a Stalinist agent. The Socialist Party is proud to stand in the tradition of Leon Trotsky – Watson thinks it is a term of abuse. In our view it is a badge of honour. Our party, and our forerunner organisation the Militant, has a proud record of fighting for ordinary people . For example helping to organise the historic fight against Thatcher’s poll tax which not only beat the hated tax but also got rid of the so called Iron Lady, campaigning against PFI and privatisation in our NHS and stopping evictions due to the hated Tory Bedroom tax. These are just a few examples. There are many more. We fight against the cuts and austerity, but also against the capitalist system itself and put forward a socialist alternative not just in this country but across the world. People like Tom Watson, Tony Blair and Neil Kinnock hate Trotskyists and genuine socialists – because we believe that the Labour Party and the trade unions should be under the control of the members, not Blairites who have no interest in standing up for ordinary people. The effort that they went to in expelling Dave Nellist from the Labour Party shows the lengths they will go to. We invite everyone to look at this article from the national website of the Socialist Party to find out more about the real ideas of Leon Trotsky. Importantly, now more than ever we need the ideas and programme of Marxism, Trotskyism and genuine democratic socialism to defend Jeremy Corbyn and to build the fight against capitalism. We urge you to fill in the form below to find out more and get involved!